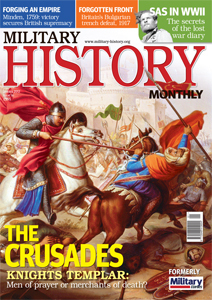 The January 2012 issue of Military History Monthly, the British Military History magazine, is on sale today. Modern fiction has immortalised the Order of the Temple as a force for good. But how much of that portrayal is true? MHM casts a critical eye over the romanticised image of the famous order of 12th-century warrior-monks. After the victories at Plassey and Quebec, the British Army had one more crucial battle to fight on the field of Minden before British imperial supremacy was secured. To celebrate the 70th anniversary of the formation of the SAS, Gordon Stevens tells the story of the long-lost SAS War Diary and the secrets it reveals. Regular MHM contributor Keith Robinson argues that the Japanese attack on Pearl Harbor on 7 January 1941 was a desperate and hopeless gamble on the part of Japan’s militarist elite. History often overlooks the fighting on the Macedonian Front during WWI. Here, MHM sheds light on the British attack of the Bulgarian trench-fortress of Doiran in spring 1917. Also in this issue: Museums, Book Reviews and Battlefield guides. Military History Monthly is the new monthly magazine dedicated to answering the big questions of military history. The aim is not only to bring you action-packed narrative, but to provide all the technical detail, in-depth analysis, and cutting-edge controversy you need to understand not just what happened, but also why. Military History Monthly aims to bridge the gap between the general reader and the world of professional soldiers and military historians. Fascinating in itself, conflict has shaped the whole of history, and continues to remake the world today. This is the magazine for everyone who wants to understand war, past and present, in all its dimensions.